This topical project focused on multipurpose, adaptable, and networked infrastructures. The initiative was started in 2007 to further experiment with and research designed landscapes, planned spaces, and conventional grey infrastructure in order to expand conventional performance parameters. Findings concluded that a redefinition of infrastructure was called for as infrastructure was experiencing a paradigm shift where multiple uses and ecological health was increasingly vital. Exemplary projects required expanded expertise beyond planners and engineers to fully realize the benefits to cultural and natural systems. These projects are characterized by high performance values, aggregated elements to mitigate negative impacts, a networked structure that connects, an incremental process that allows for flexibility over time, and were termed landscape infrastructure. 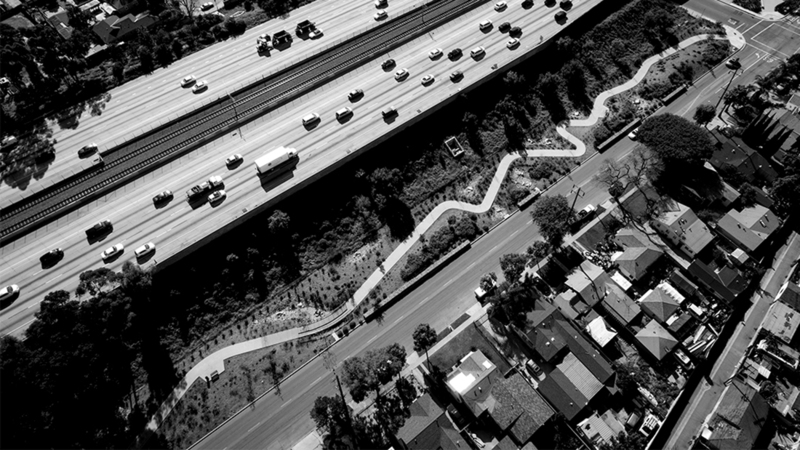 IRIS research quantified the benefits of these projects through case studies looking at sites at rivers, landfills, roofs, freeways, rails, and canals. The selected high-performance project designs were defined by wildlife biodiversity and ecological health, traditional infrastructure service provision, economic benefits, human health and safety, social and cultural benefits, and emissions reductions. IRIS led to a later book on these subjects, Landscape Infrastructure. ULI Fall Meeting 2012 “From Eye Sore to a Must See: Creating Urban Parks from Thin Air and Adding Real Estate Value.” Gerdo Aquino. Landscape Urbanism Journal 01: Indeterminacy and Multiplicity. “The Re-Representation of Urbanism.” Gerdo Aquino. Summer 2011. ASLA’s The Dirt “Three Years Later: California Academy of Sciences’ Living Roof Also Educates the Design Community.” Gerdo Aquino.